Who Invented the Induction Motor? Katharine Blodgett was a well accomplished engineer/scientist at the GE Research Lab in Schenectady, NY who discovered methods for working with monomolecular coatings. She applied this knowledge to improve of eyeglasses, camera lenses, deicing for aircraft materials, poison gas absorbents and more. Katharine Blodgett was born in Schenectady (January 10, 1898) but moved after her father was shot by a burglar. Her father George R. Blodgett was a nationally famous patent attorney for General Electric, the murderer hung himself and the mystery of the event remains to this day. Katharine and her mother moved to France. She returned to New York City and went to the Rayson School. She got a better education than most girls of the time and showed a talent for mathematics and physics. After getting her Bachelors at Bryn Mawr College she pursued a masters at University of Chicago. At 21 years old she published an important paper on paper on gas mask materials in the Physical Review. In 1926 she became the first woman to get a PhD in physics from Cambridge University. Katharine worked with Irving Langmuir who had worked with her father at the GE Research Lab. They worked on thin films of only a few molecules thick. She developed a way to use single molecule thick coatings of barium to increase the amount of light passing through glass. She developed non-reflective coatings for eyeglasses and improved lenses used in cinematography. She worked on two patents with Vince Schaefer, another great mind of GE at the time. She developed a method using a color gauge to measure the thickness of thin monomolecular films in 1933. Five years later she creates a system to make non-reflecting glass. Normal glass reflects a significant portion of light, however using a coating consisting of 44 layers of liquid soap at one molecule each (four millionths of an inch) she could get 99% of light to pass through the glass. Later on engineers devised a way to create the same coating which would be durable and not wipe off. Blodgett also worked on war time technology. She developed a better smoke screen where only two quarts of oil could be vaporized to cover several acres, the smoke would remain in the air a long time due to the molecule-sized particles. She helped with meteorological sciences by developing a device to measure humidity rapidly as weather balloons ascended into the upper atmosphere. Blodgett loved gardening and acting in plays with the Schenectady Civic Players. She had a home on Lake George in the Adirondack Mountains. She was an active conservationist along with Langmuir and their contemporaries at the Research Lab. She helped other women through involvement with a club of professional women called the Zonta Club. Katherine Burr Blodgett was born on January 10, 1898 in Schenectady, New York. Her parents were George Bedington Blodgett and Katherine Buchanan Burr. Her father was head of the patent department at the General Electric Company when he was murdered in his home by a burglar in 1897, a month before Katherine was born. The intruder escaped and was never caught. After her father's death, the family moved to New York City, then France, where Blodgett became fluent in French. For her secondary education, in 1912 Blodgett returned to New York City to attend the private Rayson School run by three English sisters.. From a very young age she showed potential in mathematics. Katherine graduated from high school at the age of fifteen and in 1913 won a scholarship to Bryn Mawr College in Pennsylvania. There, under the tutelage of two inspiring professors — Charlotte Scott in mathematics and James Barnes in physics — Blodgett graduated second in her class in 1917 with a degree in physics. Toward the end of her studies at Bryn Mawr, on a Christmas vacation at age 18, Katherine visited the General Electric Company and met Irving Langmuir, who had worked with her father. Langmuir encouraged her to further her education before trying to obtain a position at GE. In 1917, Blodgett entered the University of Chicago and began working with Harvey B. Lemon on the adsorption of gases on charcoal. This knowledge helped her invent gas masks that saved many lives during World War II. She received an MA in chemistry from the University of Chicago in 1918. Her research work there was published after World War I.
Langmuir was impressed with Blodgett's skill and dedication and hired her as his assistant, the first woman to attain such a position. In 1924, Blodgett won a place as a physics doctoral student at Sir Ernest Rutherford's Cavendish Laboratory, one of the most prestigious centers of scientific learning in the world. Her doctoral dissertation pertained to the behavior of electrons in ionized mercury vapor. In 1926, Blodgett became the first woman to earn a Ph.D. in physics from Cambridge University. 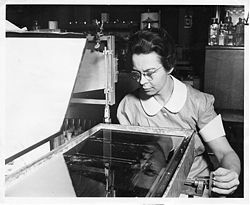 Later that year, Blodgett returned to GE, reestablished her long-time collaboration with Langmuir, and worked with him on many different projects, including those involving thin films. Langmuir, described Blodgett as a "gifted experimenter" with a "rare combination of theoretical and practical ability." She soon became an expert on thin films in her own right. In 1938 she invented nonreflecting glass by building up a 44-molecule thick film on the glass surface. Soon after this she developed a gauge to determine the thickness of these thin films. The other methods for measuring this were only accurate to a few thousandths of an inch but Blodgett's way was accurate to about one millionth of an inch. She obtained six U.S. patents for this work. Because of their many contributions to the science and technology of thin films, that general area is known as Langmuir-Blodgett technology. During the Second World War, Blodgett turned her attention to such military applications as airplane deicing and smokescreen machines. 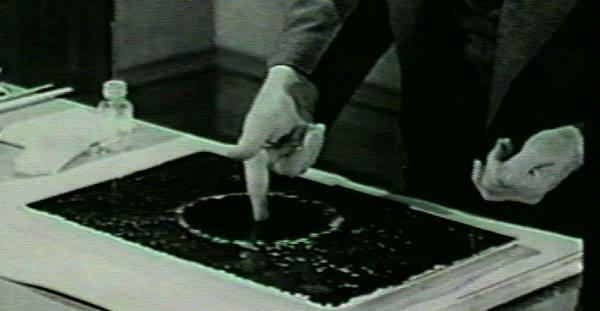 The invention of the 'color gauge,' which permits film measurement within one microinch, began with Dr. Blodgett's discovery in December 1933 that monomolecular layers of stearic acid, each about one ten-millionth of an inch in thickness, could be successively deposited on to a plate lowered into the solution. This enabled her to construct films in a series of progressive thicknesses, of which each reflects a characteristic color in white light. Her method of depositing sheets of barium stearate on plates enables a standardized color gauge to be constructed. "Anyone who wishes to measure the thickness of a film which is only a few millionths of an inch thick," she said, "can compare the color of his film with the series of colors in the gauge. The step on the gauge that matches his film in color will give him a measure of its thickness." In December 1938 GE announced that Katherine Blodgett had succeeded in developing a nonreflecting 'invisible' glass. Ordinary glass is visible because of the light rays which are reflected from its surface, and when a film is placed upon the glass, Dr. Blodgett discovered that a coating of forty-four layers of one-molecule-thick transparent liquid soap, of about four-millionths of an inch or one-fourth the average wave length of white light, made sheets of glass invisible. Since the reflection from the soap film neutralizes the reflection from the glass itself, the crests and troughs of the two sets of light waves cancel each other, thereby eliminating reflected light. At the same time, the soap varnish is a good conductor of light, permitting 99% of the light striking it to pass through. The one aspect of Dr. Blodgett's intensive work on nonreflecting glass requiring further research was the development of much harder coatings that could not be wiped off. Some of the applications of the invention can be seen in automobile windshields, store windows, showcases, camera lenses, spectacles, telescopes, picture frames, and even submarine periscopes. Langmuir was the first to show that monolayers can be transferred from the air/water interface to solid substrates for further study. Together with Katherine Burr Blodgett, he showed that it was possible to go further and to deposit many monolayers onto the same substrate, thus building up a multilayer stack of any required thickness. Deposited monolayers of whatever thickness are now known as Langmuir-Blodgett films. Blodgett was honored for her work in many ways - she received honorary doctorates of science from Elmira College in 1939, Brown University in 1942, Western College in1942, and Russell Sage College in 1944. In 1951 she was the first industrial scientist to be awarded the American Chemical Society's Garvan Medal. That same year, Schenectady honored her with Katherine Blodgett Day for her scientific and civic contributions. She was a member of the American Physical Society and the Optical Society of America. She also won the Photographic Society of America's Progress Medal in 1972. Although Katherine was an important and an intelligent and accomplished scientist, she had many avocations. She was an actress with her town's theater group. She also volunteered for many civic and charitable organizations. She also enjoyed writing funny poems such as the one below. "That formaldehyde polyvinyl- If you eat it, you'll dine ill. One night at a party, When the guests all ate hearty, By actual count it made nine ill."
Katherine Burr Blodgett retired from the General Electric Company in 1963. Her discoveries are still important today. Her way of measuring transparent objects is still being used. A native of Schenectady, she spent nearly all of her adult life in that city, where she helped pave the way for women physicists and scientists around the world. Dr. Blodgett died in her home at 18 North Church Street, Schenectady, NY at 7:00 a.m., October 12, 1979, at the age of 81. At her death, one of her coworkers, Vincent J. Schaefer, recalled that "the methods she developed have become classical tools of the science and technology of surfaces and films. She will be long — and rightly — hailed for the simplicity, elegance, and the definitive way in which she presented them to the world." Article by M.Whelan and Dr. Edwin Reilly Jr. If you are a historian and wish to correct facts or publish a commentary or embedded article feel free to contact us. Photos:: Permission and fees are required for use of photos in printed or internet publications. Educational Use:: Students and teachers may use photos and videos at school. Graphics and photos must retain the Edison Tech Center watermark or captions and remain unmanipulated except for sizing. Videos:: DVDs are available for personal/educational use. Republication of any part or whole of any ETC video requires a professional license agreement. Contact us for legal permissions and fees.